A few months ago you may have noticed something on Facebook or Google+ called the Black and White Challenge. It was a challenge started by photographers to post a black and white photo every day for five days. Typically someone would nominate you and you could then nominate someone else. Challenges like this can be a good way to improve your skills or force you to take and post photos. For me it was a perfect way to focus my photography while traveling. A lot of times it’s easy to aimlessly shoot photos as you walk around but having a mission to accomplish can be a fun way to seek out travel photos. 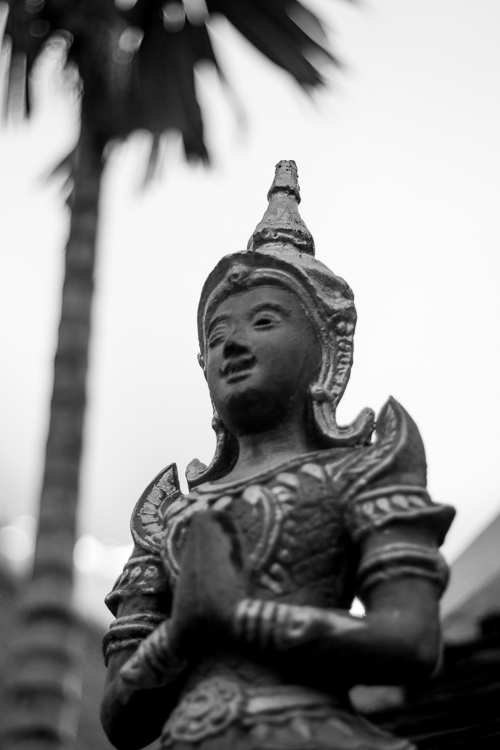 I walked around Chiang Mai with my 50mm lens because it’s smaller and lighter and gives me an opportunity to create shallow depth of field. Ornate strings of bells are everywhere in Chiang Mai near the temples. 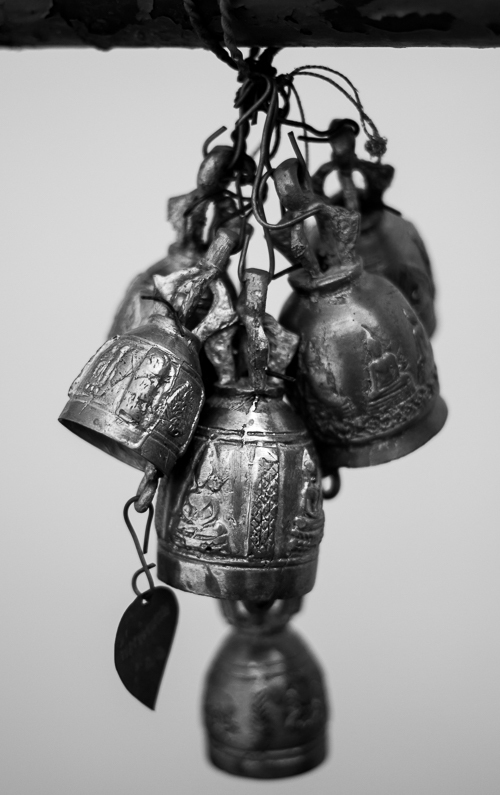 The small details in each bell caught my eye. We found a small secret garden tucked away behind a high stone wall where statues were made and sold. 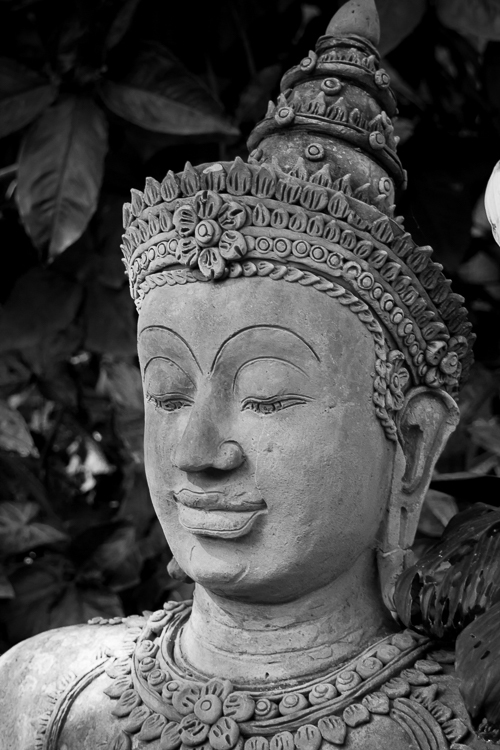 A quiet, calm place with moss covered Buddhas in the shade. A day trip to see the temples of Lamphun. 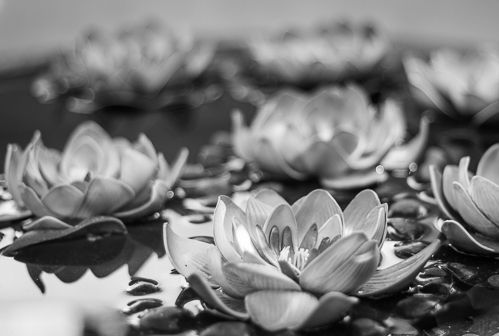 A large planter pot with brightly colored lotus flowers also looked beautiful in black and white. The road around the moat at night. 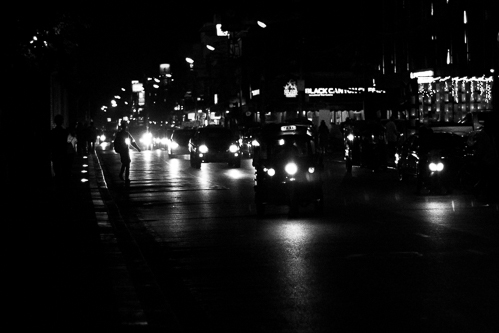 A busy tree-lined street that is always full of motorbikes and tuk tuks. If you’re new to travel photography try giving yourself a challenge like this one or writing down what you’d like to shoot before you go out with your camera. Sometimes just thinking about it beforehand will help you to focus your time. Check out Unknown Home for more travel stories and photography!